Director – Ron Howard, Screenplay – Ken Kaufman, Based on the Novel The Last Ride by Thomas Eidson, Producers – Ron Howard, Brian Grazer & Daniel Ostroff, Photography – Salvatore Totino, Music – James Horner, Visual Effects – &Company (Supervisor – David Isyomin), Digital Domain (Supervisor – Joel Hynek) & Pacific Title (Supervisor – Kevin Braun), Special Effects Supervisor – James Roberts, Chidin Makeup Design – Matthew W. Mungle, Art Direction – Guy Barnes. Production Company – Imagine Entertainment/Revolution Studios/Daniel Ostroff Productions. New Mexico, 1885. Maggie Gilkeson lives on a ranch with her two daughters and works as a healer. Samuel Jones, a White man who lives among the Apache, comes seeking medical help and Maggie’s daughters are startled to learn that Jones is her father. Maggie regards Jones as unwelcome because of his abandonment of her as a child, and heals him and then tells him to go. Maggie’s two daughters set out to go to a fair, accompanied by her two ranch hands. Maggie then finds the two ranch hands murdered and her oldest daughter Lily abducted. When Maggie learns that the local sheriff intends to do nothing, she reluctantly asks the help of her father in tracking Lily. Jones discovers that Lily has been abducted by Chidin, an American Indian sorcerer who intends to sell Lily and a group of other abducted girls into slavery in Mexico. They set out on the trail. Along the way, Maggie gradually overcomes her distrust of her father. However, in their quest they must also face the dark sorceries of Chidin. Ron Howard began life as an actor on tv series such as The Andy Griffith Show (1960-8) and Happy Days (1974-84), before branching out as a director. These days he stands at the front of the Hollywood directorial A-list. Howard initially seemed to do well with light comedies such as Night Shift (1982) and Splash! (1984). Since then however, an increasing tone of self-important seriousness began to overtake his films, with the likes of banal Cocoon (1985), Apollo 13 (1995) (which is probably Howard’s best film), the entirely overrated A Beautiful Mind (2001), which finally netted Howard a Best Director Oscar, and The Da Vinci Code (2006). Even ostensibly lighter Howard films such as Far and Away (1994) and the Dr Seuss adaptation How the Grinch Stole Christmas (2000) seem overtaken by a ponderous heavy-handedness. (See below for Ron Howard’s other genre films). The Missing was Ron Howard’s attempt to conduct a Western. 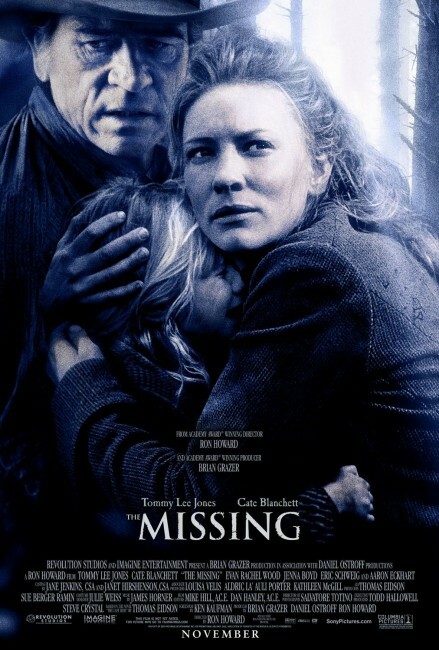 Though the film’s horror elements were pumped up in the advance publicity to make The Missing seem a potentially interesting horror/Western hybrid, this is not the case at all. 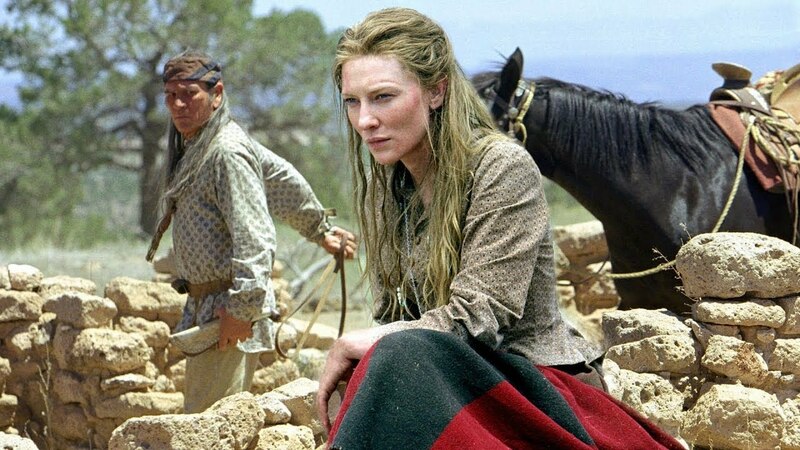 The Missing emerges more as Dr Quinn, Medicine Woman (1993-8) does The Searchers (1956) or True Grit (1969) with a few dashes of The Manitou (1978) thrown in. Ron Howard and screenwriter Ken Kaufman certainly cast an epic canvas – some beautifully sweeping New Mexico location photography, a great deal of authenticity clearly placed into getting the period detail and costumery right, and an epic-sized story. However, Ron Howard’s characteristic blandness sinks the exercise. You could easily imagine The Missing having been conducted as a John Ford Western during the 1950s, although the sheer self-importance of the production would have been trimmed down and the film made with a much more kinetic thrust than it has. For one, John Ford would almost certainly have cut the film’s 130 minute running time down. He would in all probability also have cut many of the extraneous characters around the edges – Ray McKinnon’s photographer who is there for no real other purpose than to demonstrate that Chidin is like the bad guy of the show, or the scenes where Cate Blanchett and Tommy Lee Jones comes across an Apache man who is searching for his daughter and the scenes healing his son. It feels almost as though Ron Howard and Ken Kaufman took such a reverential attitude toward the source novel that they could not bear to trim a single scene. Almost certainly, any other director would have pumped up the two things that should have been at the centre of the film – the drama and suspense of the chase and the emotional reconciliation between Cate Blanchett and father Tommy Lee Jones. 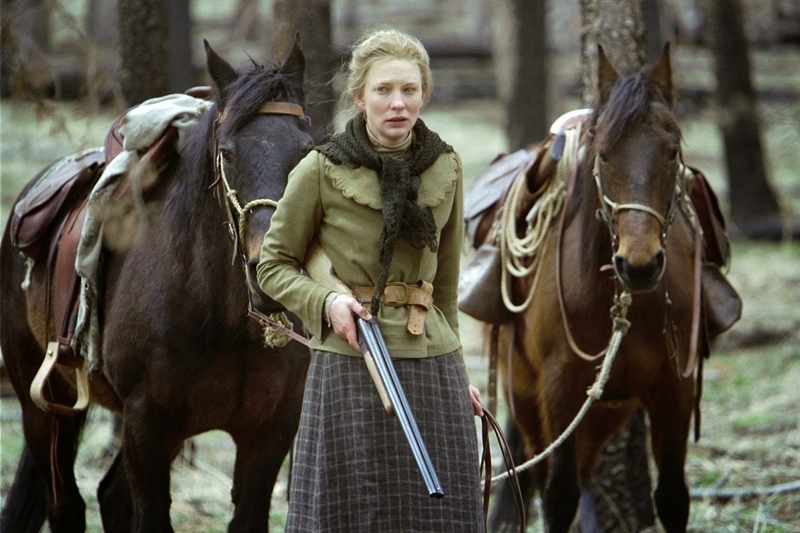 One would think that these things would have been at the core of the film – but Ron Howard never gives us any scene of reconciliation between Cate Blanchett and Tommy Lee Jones, while the tension of the pursuit and eventual showdown between Tommy Lee Jones and the bad guy Indian is conducted with a plodding predictability. Westerns of the 1990s – the likes of The Last of the Mohicans (1992), Unforgiven (1992), Geronimo: An American Legend (1993), Tombstone (1993), Wyatt Earp (1994), tv’s Tecumseh: The Last Warrior (1995), Wild Bill (1995), Posse (1996), Cheyenne (1996) and most notably Dances with Wolves (1990) and subsequently tv’s Deadwood (2004-6) – have mounted a concerted revisionist take on the Western, one that deconstructs classic Western black-and-whites – sheriffs and ranchers as good guys, Injuns as bad guys – to show a view that corresponds more with the historical truth – that the Indians were a people who had had their land stolen from them and were regarded as less-than-human by white settlers, while the gunslinging heroes of yore were more accurately drunks, murderers and rapists. Ron Howard buys into the revisionist view of the Indian and offers up a number of scenes showing the Indians as drunken and enslaved, while Cate Blanchett’s heroine has a credible (although never explored) pro-Christian and racist view towards the Indians, and we see other scenes that potently portray the US military as more interested in looting the houses of their victims than in pursuing the abductors. The film also makes much effort to obtain an authentic portrait of the Apache, with dialogue dubbed into the Apache language and the end credits containing a number of acknowledgments for language and cultural advisers. Yet at the same time as he buys the revisionist Western views, Ron Howard also tries to eat his cake too. He wants to show a reverential portrait of the culture, but at the same time also buys into cliché views of the Indian. The evil sorcerer is a bad guy Indian painted in black-and-white terms that are no different from the racial caricatures of a 1940s B Western. Despite the authenticity paid toward the Apache culture, the scenes of Chidin’s black magic are cliché views like something out of a B voodoo movie. Certainly, there is nothing to these scenes that in any way delves into the spiritual underpinnings and mythology of real Native American beliefs. Ron Howard’s other genre films are:– the mermaid comedy Splash! (1984); Cocoon (1985) about a meeting between geriatrics and extra-terrestrials; the George Lucas sword-and-sorcery collaboration Willow (1988); Apollo 13 (1995) based on the true life 1970 space mission disaster; the Dr Seuss adaptation How the Grinch Stole Christmas (2000); The Da Vinci Code (2006) based on the historical/religious conspiracy bestseller and its sequels Angels & Demons (2009) and Inferno (2016); and Solo: A Star Wars Story (2018).